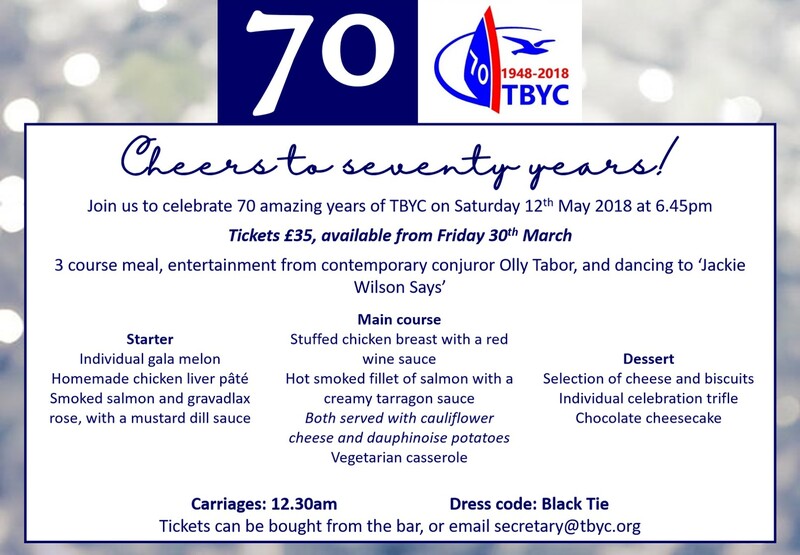 Thank you so much to all of you that have booked for what I’m sure will be a great evening. The event has proven extremely popular, therefore, regretfully I cannot take any further bookings. Please, allow time for changing and rigging. I recommend single handed sailing. Parents – please, encourage and support your sailors! 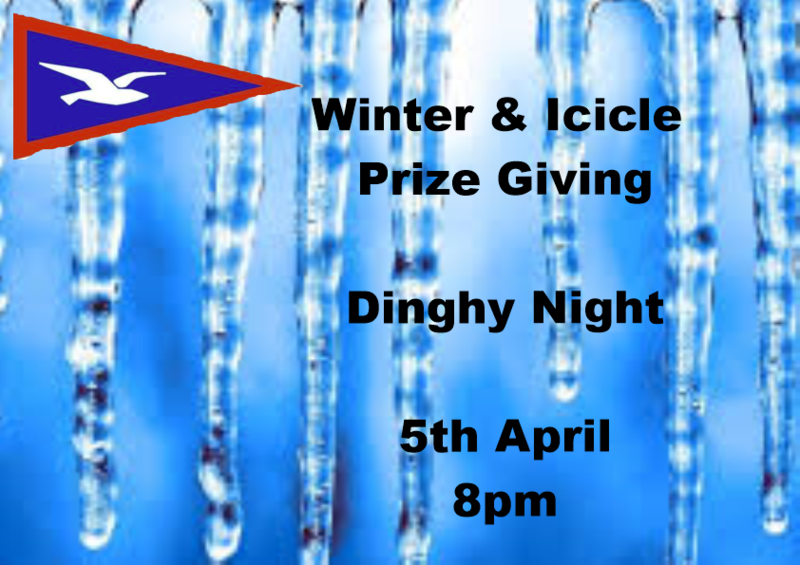 All keen sailors are welcome, no particular experience needed. Minimum requirement: willingness to go afloat. Easter Sunday will be a Carvery of Roast Chicken Breast wrapped in Pancetta, Roast Beef, Leg of Lamb and Leg of Pork. Poached Salmon and Stuffed Peppers will also be on offer. I hope to see you then, please book if you are able to. The 2018 Sailing Instructions are attached covering club racing from 30 March 2018 to 7 October 2018. For Spring, Summer and Autumn series races, the same 3 starts ( at 3 minutes intervals) , 3 courses ( 2 windward/leeward and 1 square) and 5 fleets ( Windward/Leeward, Slow Catamaran, Fast Mono-hull, Slow Mono-hull and Sandhopper) as in 2017 are retained. 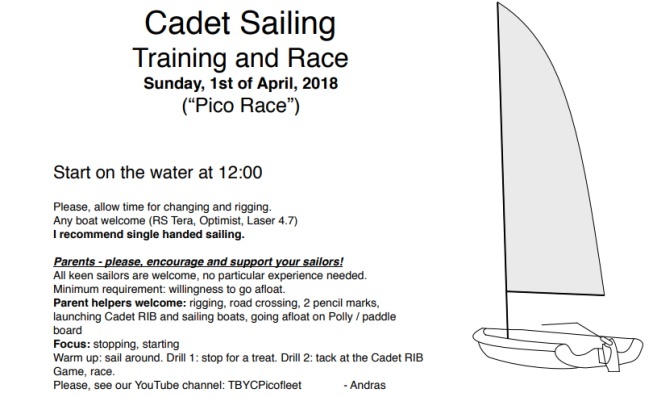 There is no separate Cadet fleet /series/course in 2018. One change for 2018 is that results for all general handicap trophy races ( except the pursuit race) will also count towards the series ( Spring, Summer, or Autumn) in which the race occurs. Reminder: Helms who have entered any series race ( including the Midweek Series), and which now include trophy races, can claim average points for a particular race if they are undertaking any of the club race duties ( except Duty Officer) on that day. Average Points can be claimed by indication on the Declaration Sheet on the day. Looking for someone interested in regular sandhopper boat cleaning. Will need to be done weekly high season, bi-weekly early season and in situ on the mud. There are several boats that are interested in this service. 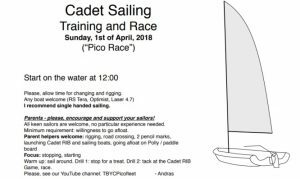 There will be 3 days of Cadet Race Training and a Mini Race series at the end of the Easter holidays for 11+ year old boys and girls. The training will be progressive and it is hoped that Cadets can attend all three days, however, less is still fine. The training will cater for all abilities, but the minimum requirement is to be able to sail a beat, reach and run. We also welcome new Cadet members; a great way to meet new friends, while training and having a good time. Reserve the dates for a great start to the season. Parental help will be most appreciated to help on ‘Polly’ with Safety and Scoring etc.